The huge harvest is again driving down prices for consumers and putting pressure on growers who aren't getting the price they hoped for after a similar phenomenon in 2017. SALEM, Ore. — For the second year in a row, Oregon cannabis farmers have harvested more than a million pounds of usable marijuana. The huge harvest is again driving down prices for consumers and putting pressure on growers who aren’t getting the price they hoped for after a similar phenomenon in 2017, The Bulletin reported Thursday. Oregon’s cannabis market is limited to sales within the state’s borders, yet the state of about 4 million people has 1,107 licensed active producers and another 900 producers seeking licenses from the Oregon Liquor Control Commission. There is also no cap on the number of licenses issued by the state, but the commission did place a temporary freeze on new applications last summer to try to address the glut. Growers harvested more than 2.5 million pounds of cannabis in October. Of that so-called wet harvest, 1.3 million pounds of usable marijuana was logged into the Oregon Liquor Control Commission’s cannabis tracking system as of December, according to the agency’s latest report. In 2017, the fall harvest reaped nearly 2.6 million pounds of wet product and about 1 million pounds of usable marijuana. Last year, cannabis farmers statewide cut back the amount they planted, while others didn’t plant at all, and some surrendered their licenses, said Don Morse, a Portland cannabis consultant. As of Wednesday, 70 grower licenses were expired, and 57 licenses were surrendered, according to commission data. 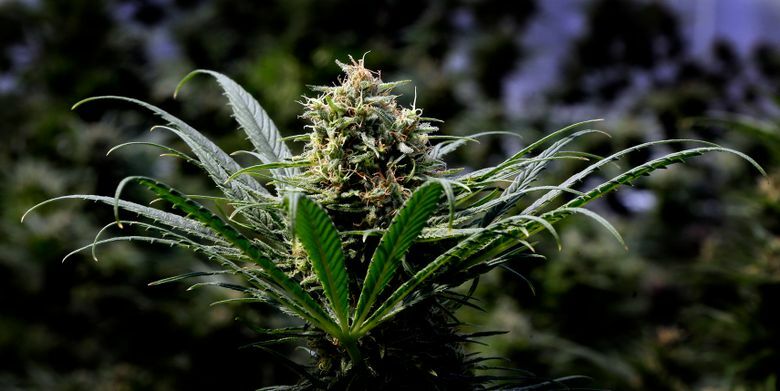 There is one silver lining: People are buying so much pot that Oregon’s marijuana tax collections have exceeded the forecast by 7 percent in the 2017-2019 biennium, according to the Oregon Office of Economic Analysis. State economists noted that ongoing growth in sales volumes has been more than enough to make up for falling prices. Prices for pot last year plunged as much as 50 percent, Whitney said. This year could see prices drop by 35 to 50 percent more, he said. Gov. Kate Brown said Thursday in a conference call with reporters that the discrepancy between state and federal laws remains the biggest hurdle for alleviating the oversupply. The newly sworn-in Congress could push through changes to help growers, she added. The U.S. House is controlled by Democrats, including some who favor making marijuana legal at the federal level, such as Oregon Rep. Earl Blumenauer. Brown said she also hopes that Congress will act to allow banks to do business with the marijuana industry. “This Congress can be of incredible use to us,” she said. At the state level, Oregon State Sen. Floyd Prozanski, a Democrat from Eugene, plans to reintroduce parts of a 2017 bill that would have allowed Oregon to enter into agreements with California and Washington for coordination of marijuana-related businesses, The Statesman Journal reported this week. Shipping marijuana by air would be prohibited and pot couldn’t be transported through a state that didn’t agree. Brown said she wants to work with Prozanski and others on statutes that could alleviate Oregon’s pot problem. The numbers in the commission report also reflect the growing popularity of concentrates and tinctures over the dried marijuana flower — the “bud” that’s traditionally been smoked for a high. That dovetails with a study of consumer habits by New Frontier Data and MJ Freeway, a cannabis technology firm, The Bulletin said. The market share of concentrates has nearly reached parity with flower, growing 138 percent since 2015, from 16 percent of retail sales to 38 percent in October 2018, according to the study.